In my previous post I argued that the human body may react to “eating big” as it would to overfeeding, increasing energy expenditure by a certain amount. That increase seems to lead to a reduction in the caloric value of the meals during overfeeding; a reduction that seems to gravitate around 14 percent of the overfed amount. And what is the overfed amount? Let us assume that your daily calorie intake to maintain your current body weight is 2,000 calories. However, one day you consume 1,000 calories, and the next 3,000 – adding up to 4,000 calories in 2 days. This amounts to 2,000 calories per day on average, the weight maintenance amount; but the extra 1,000 on the second day is perceived by your body as overfeeding. So 140 calories are “lost”. The mechanisms by which this could happen are not entirely clear. Some studies contain clues; one example is the 2002 study conducted with mice by Anson and colleagues (), from which the graphs below were taken. In the graphs above AL refers to ad libitum feeding, LDF to limited daily feeding (40 percent less than AL), IF to intermittent (alternate-day) fasting, and PF to pair-fed mice that were provided daily with a food allotment equal to the average daily intake of mice in the IF group. PF was added as a control condition; in practice, the 2-day food consumption was about the same in AL, IF and PF. After a 20-week period, intermittent fasting was associated with the lowest blood glucose and insulin concentrations (graphs a and b), and the highest concentrations of insulin growth factor 1 and ketones (graphs c and d). These seem to be fairly positive outcomes. In humans, they would normally be associated with metabolic improvements and body fat loss. Let us go back to the 14 percent advantage of eating little and then a lot; a pattern of eating that can be implemented though intermittent fasting, as well as other approaches. So, as we have seen in the previous post (), it seems that if you consume the same number of calories, but you do that while alternating between underfeeding and overfeeding, you actually “absorb” 14 percent fewer calories – with that percentage applied to the extra calorie intake above the amount needed for weight maintenance. And here is a critical point, which I already hinted at in the previous post (): energy expenditure is not significantly reduced by underfeeding, as long as it is short-term underfeeding – e.g., about 24 h or less. So you don’t “gain back” the calories due to a possible reduction in energy expenditure in the (relatively short) underfeeding period. What do 140 calories mean in terms of fat loss? Just divide that amount by 9 to get an estimate; about 15 g of fat lost. This is about 1 lb per month, and 12 lbs per year. Does one lose muscle due to this, in addition to body fat? A period of underfeeding of about 24 h or less should not be enough to lead to loss of muscle, as long as one doesn’t do glycogen-depleting exercise during that period (). Sounds good? It actually gets better. Underfeeding tends to increase the body’s receptivity to both micronutrients and macronutrients. This applies to protein, carbohydrates, vitamins etc. For example, the activity of liver and muscle glycogen synthase is significantly increased by underfeeding (the scientific term is “phosphorylation”), particularly carbohydrate underfeeding, effectively raising the insulin sensitivity of those tissues. The same happens, in general terms, with a host of other tissues and nutrients; often mediated by enzymes. This means that after a short period of underfeeding your body is primed to absorb micronutrients and macronutrients more effectively, even as it uses up some extra calories – leading to a 14 percent increase in energy expenditure. There are many ways in which this can be achieved. Intermittent fasting is one of them; with 16-h to 24-h fasts, for example. Intermittent calorie restriction is another; e.g., with a 1/3 and 2/3 calorie consumption pattern across two-day periods. Yet another is intermittent carbohydrate restriction, with other macronutrients kept more or less constant. If the same amount of food is consumed, there is evidence suggesting that such practices would lead to body weight preservation with improved body composition – same body weight, but reduced fat mass. This is what the study by Anson and colleagues, mentioned earlier, suggested (). 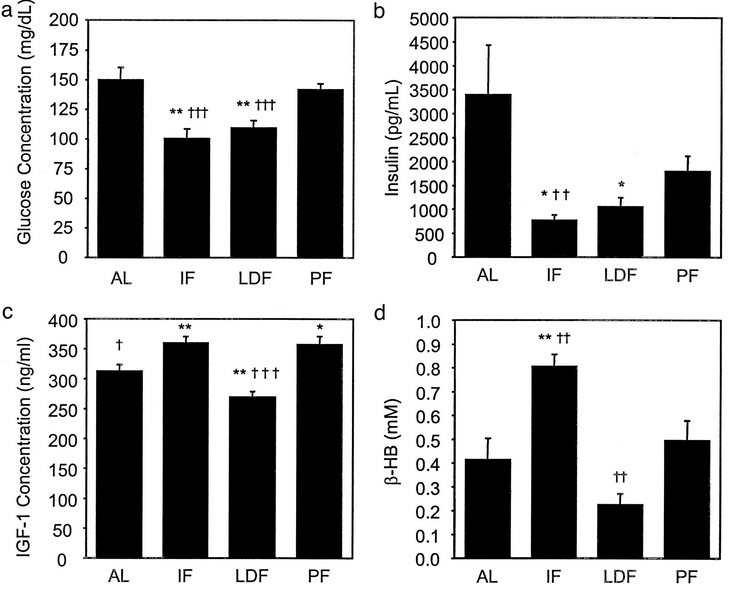 A 2005 study by Heilbronn and colleagues on alternate day fasting by humans suggested a small decrease in body weight (); although the loss was clearly mostly of fat mass. Interestingly, this study with nonobese humans suggested a massive decrease in fasting insulin, much like the mice study by Anson and colleagues. Having said all of the above, there are several people who gain body fat by alternating between eating little and a lot. Why is that? The most likely reason is that when they eat a lot their caloric intake exceeds the increased energy expenditure. The 14-percent advantage of eating little and then a lot: Is it real? When you look at the literature on overfeeding, you see a number over and over again – 14 percent. That is approximately the increase in energy expenditure you get when you overfeed people; that is, when you feed people more calories that they need to maintain their current weight. 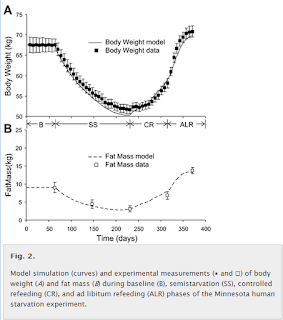 This phenomenon is related to another interesting one: the nonlinear increase in body weight and fat mass following overfeeding after a period starvation, illustrated by the top graph below from an article by Kevin Hall (). The data for the squares on the top graph is from the Minnesota Starvation Experiment (). The graph at the bottom is based mostly on the results of a simulation, and doesn’t clearly reflect the phenomenon. Due to the significant amount of weight lost in what is called above the semistarvation stage (SS), the controlled refeeding period (CR) actually involved significant overfeeding. Nevertheless, weight was not gained right away, due to a sharp increase in energy expenditure. That is illustrated by the U-curve shape of the weight gain in response to overfeeding. Initially the gain is minimal, increasing over time, and continuing through the ad libitum refeeding stage (ALR). Interestingly, overfeeding leads to increased energy expenditure almost immediately after it starts happening. It seems that even one single unusually big meal will significantly increase energy expenditure. Also, the 14 percent is usually associated with meals with a balanced amount of macronutrients. That percentage seems to go down if the balance is significantly shifted toward dietary fat (), probably because the metabolic “cost” of converting dietary fat into body fat is low. In other words, large meals with a lot of fat in them tend to cause a reduced increase in energy expenditure – less than 14 percent. Shifting the balance to protein appears to have the opposite effect, increasing energy expenditure even more, probably because protein is the jack-of-all-trades among macronutrients (). The calorie surplus used in experiments where the 14 percent increase in energy expenditure is observed is normally around 1,000 calories, but the percentage seems to hold steady when people are overfed to different degrees () (). Let us assume that one is overfed 1,000 calories. What happens? About 140 calories are “lost” due to overfeeding. What does this have to do with eating little, and then a lot, in an alternate way? It allows for some reasonable speculation, based on a simple pattern: when you alternate between underfeeding and overfeeding, you reduce food consumption for short period of time (usually less than 24 h), and then eat big, because you are hungry. It is reasonable to assume, based on the empirical evidence on what happens during overfeeding, that the body reacts to “eating big” as it would to overfeeding, increasing energy expenditure by a certain amount. That increase leads to a reduction in the caloric value of the meals during overfeeding; a reduction of about 14 percent of the overfed amount. But the body does not seem to significantly decrease energy expenditure if one reduces food consumption for a short period of time, such as 24 h. So you have the potential here for some steady fat loss without a reduction in caloric intake. Keeping a calorie intake up above a certain point is more important than many people think, because a calorie intake that is too low may lead to nutrient deficiencies (). This is possibly one of the reasons why carrying a bit of extra weight is associated with increased longevity in relatively sedentary populations (). Is this 14-percent effect real, or just another mirage? If yes, what does it possibly translate into in terms of fat loss? More on these issues is coming in the next post. The lowest-mortality BMI: What is the role of nutrient intake from food? In a previous post (), I discussed the frequently reported lowest-mortality body mass index (BMI), which is about 26. The empirical results reviewed in that post suggest that fat-free mass plays an important role in that context. Keep in mind that this "BMI=26 phenomenon" is often reported in studies of populations from developed countries, which are likely to be relatively sedentary. This is important for the point made in this post. A lowest-mortality BMI of 26 is somehow at odds with the fact that many healthy and/or long-living populations have much lower BMIs. You can clearly see this in the distribution of BMIs among males in Kitava and Sweden shown in the graph below, from a study by Lindeberg and colleagues (). This distribution is shifted in such a way that would suggest a much lower BMI of lowest-mortality among the Kitavans, assuming a U-curve shape similar to that observed in studies of populations from developed countries (). Another relevant example comes from the China Study II (see, e.g., ), which is based on data from 8000 adults. The average BMI in the China Study II dataset, with data from the 1980s, is approximately 21; for an average weight that is about 116 lbs. That BMI is relatively uniform across Chinese counties, including those with the lowest mortality rates. No county has an average BMI that is 26; not even close. This also supports the idea that Chinese people were, at least during that period, relatively thin. Now take a look at the graph below, also based on the China Study II dataset, from a previous post (), relating total daily calorie intake with longevity. I should note that the relationship between total daily calorie intake and longevity depicted in this graph is not really statistically significant. Still, the highest longevity seems to be in the second tercile of total daily calorie intake. Again, the average weight in the dataset is about 116 lbs. A conservative estimate of the number of calories needed to maintain this weight without any physical activity would be about 1740. Add about 700 calories to that, for a reasonable and healthy level of physical activity, and you get 2440 calories needed daily for weight maintenance. That is right in the middle of the second tercile, the one with the highest longevity. What does this have to do with the lowest-mortality BMI of 26 from studies of samples from developed countries? Populations in these countries are likely to be relatively sedentary, at least on average, in which case a low BMI will be associated with a low total calorie intake. And a low total calorie intake will lead to a low intake of nutrients needed by the body to fight disease. And don’t think you can fix this problem by consuming lots of vitamin and mineral pills. When I refer here to a higher or lower nutrient intake, I am not talking only about micronutrients, but also about macronutrients (fatty and amino acids) in amounts that are needed by your body. Moreover, important micronutrients, such as fat-soluble vitamins, cannot be properly absorbed without certain macronutrients, such as fat. Industrial nutrient isolation for supplementation use has not been a very successful long-term strategy for health optimization (). On the other hand, this type of supplementation has indeed been found to have had modest-to-significant success in short-term interventions aimed at correcting acute health problems caused by severe nutritional deficiencies (). So the "BMI=26 phenomenon" may be a reflection not of a direct effect of high muscularity on health, but of an indirect effect mediated by a high intake of needed nutrients among sedentary folks. This may be so even though the lowest mortality is for the combination of that BMI with a relatively small waist (), which suggests some level of muscularity, but not necessarily serious bodybuilder-level muscularity. High muscularity, of the serious bodybuilder type, is not very common; at least not enough to significantly sway results based on the analysis of large samples. The combination of a BMI=26 with a relatively small waist is indicative of more muscle and less body fat. Having more muscle and less body fat has an advantage that is rarely discussed. It allows for a higher total calorie intake, and thus a higher nutrient intake, without an unhealthy increase in body fat. Muscle mass increases one's caloric requirement for weight maintenance, more so than body fat. Body fat also increases that caloric requirement, but it also acts like an organ, secreting a number of hormones into the bloodstream, and becoming pro-inflammatory in an unhealthy way above a certain level. Clearly having a low body fat percentage is associated with lower incidence of degenerative diseases, but it will likely lead to a lower intake of nutrients relative to one’s needs unless other factors are present, e.g., being fairly muscular or physically active. Chronic low nutrient intake tends to get people closer to the afterlife like nothing else (). In this sense, having a BMI=26 and being relatively sedentary (without being skinny-fat) has an effect that is similar to that of having a BMI=21 and being fairly physically active. Both would lead to consumption of more calories for weight maintenance, and thus more nutrients, as long as nutritious foods are eaten.